The garden is yielding more salad every week. The Salad Garden is producing a lot and the Family of 4 garden isn’t far behind. This week we did a final harvest on the two rows of mesclun in the Family of 4 Garden, since they are starting to bolt. We also harvested a couple rows of lettuce and almost all the remaining radishes. These bags are full of lettuce, mesclun, radishes, Swiss Chard, and beet greens from the Salad Garden and the Family of 4 Garden. 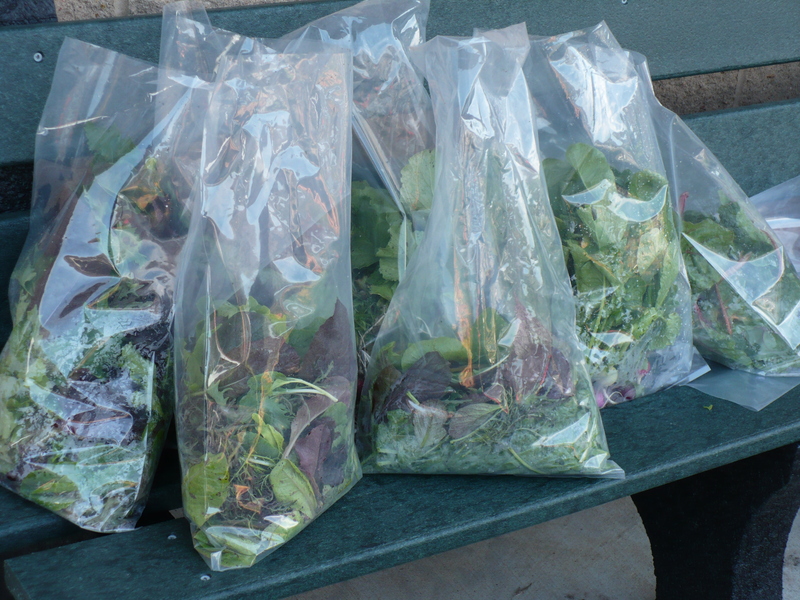 From the Family of 4 Garden, we harvested about 1.5 pounds of lettuces and mesclun. We also harvested 1 bunch of radishes. 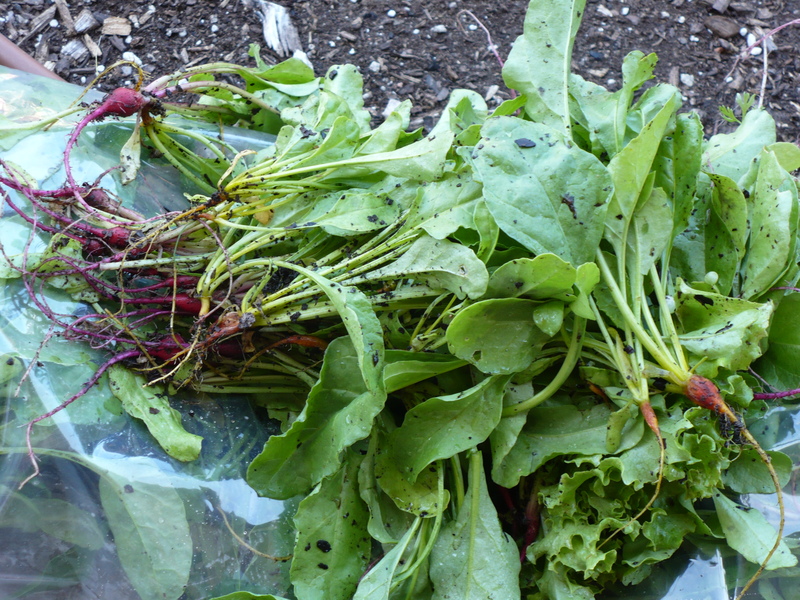 Something new from the Family of 4 Garden this week is the Swiss Chard and beet greens. The Swiss Chard was planted in mid-April, and this week was big enough to harvest some of the largest leaves. The beets we planted at the same time needed to be thinned, so we thinned them to 1 plant every 1-2 inches. Some of the plants were starting to develop tiny beets about the size of peas. Beet greens are also great for salads, so nothing got thrown away! We harvested 1 bunch of Swiss Chard leaves and about a 1.25 pounds of baby beet greens. Swiss Chard and beet greens can be used for cooking in much the same way you use spinach. Just be aware to expect an “earthier” flavor! 1.25 pounds of baby beet greens (with some tiny beets) = $12.75 Most grocery stores only carry baby beet greens as part of salad mixes, not individually. I’ll price them at the same rate as I price the salad mix, unless I find something more comparable. Today’s tentative harvest total comes out to $31.96. That brings our running total to about $71.50! Posted on May 26, 2009, in Family of 4 Garden, Harvesting & Eating and tagged salad greens, thinning seedlings, vegetable gardening, vegetables. Bookmark the permalink. Leave a comment.